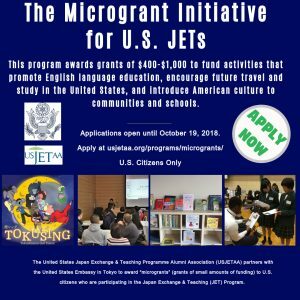 The Microgrant Initiative for American JETs is funded by the U.S. Embassy Tokyo. This program provides small grants to U.S. assistant language teachers working in Japan on the JET Programme to introduce American culture and English language to students in their classrooms and the local community. Applications for the 2018-2019 grant year are closed. All applicants have been notified of their application status. If you have any questions, you may reach us at contact@usjetaa.org. Take a look the projects that were approved for the 2017-2018 grant year. We look forward to sharing the results once all the projects are completed! Read more on our blog. 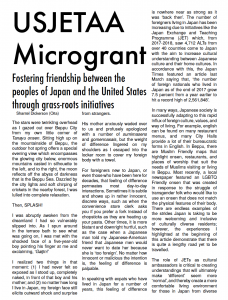 JET alumni Shantel Dickerson (Oita, 2016-2018), a recipient of one of the microgrants, wrote an article on the Microgrant Program for AJET Connect Magazine, which talks about some of the programs held by current JETs using this funding.